The protagonist of Dostoevsky’s Crime and Punishment tries to improve the world by killing an old repulsive usurer with an ax. The main character of the hallucinatory, hilarious and psychedelic Cocaine by Aleksandr Skorobogatov, the author of the acclaimed Portrait of an Unknown Girl and Sergeant Bertrand, tries to improve the world with the word, because he himself is the author and thus the almighty creator of his world. But also with a hammer and a giant nail. Because Dostoevsky commands it. And because the world invented by him is sometimes too real and certainly way too frightening. When the author bumps into a maniacal murderer of 175 million people, for example. Or when he sees the Chairman of the Nobel Committee repeatedly eating himself. And certainly when he is humiliated by his own characters. Almighty, but lonely, without a place where he can lay his head, he hopes to save and retrieve Nadezhda — the stunningly beautiful and fragile love of his life. Will he succeed? 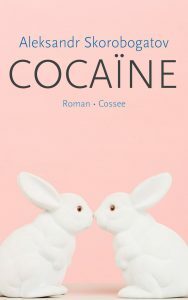 Cocaine is a richly layered novel embedded in social satire, in which both the famous Russian soul as well as the infamous Western lack thereof are being examined and skewered, in which the burlesque mixes with the tragic and tears with laughter. Skorobogatov shows us the deep ravines and unprecedented heights of fantasy, the infinite possibilities of the human spirit. A dazzling novel in the best Russian tradition, reading Cocaine is like the craziest roller coaster ride of your life. Next story Cocaïne van Aleksandr Skorobogatov: een teaser!